When you arrive in college, you know how to write. You can respond to prompts, tighten paragraphs and embellish a thesis with flair and evidence. In Honors, we work to move writing into a different kind of enterprise--one that agile, professional scholars, scientists, artists and writers use. Writing, here, becomes a means of thinking. Arguments grow complicated; descriptions become nuanced and layered. Your writing repertoire expands and deepens. In the Honors classes that I offer, we use writing as a way of finding things out. Together, we see how writing connects different disciplines and no matter what the genre, a piece of writing is always part content delivery system and part exploration. Think of high school, where writing instruction typically focuses on delivering pre-packaged ideas: setting up five paragraph essays to make introductions, three supporting points and providing a conclusion that repeats the introduction. It's not a bad scaffolding to get things under control and to present simple ideas. But, when you get to Honors, you've definitely outgrown it. Often, we hunker down and write because we don't know something. I think this is useful for a number of reasons. First, writing surfaces what you didn't know that you actually knew. Second, the practice also gives you ideas for how you might find out what you need to know. The poet William Stafford once called this "fishing." He'd get up early in the morning and settle, pen and paper in hand, onto his couch. There, in the waking hours, he'd write until something surfaced and hooked his line. For years, he made poems this way. Richard Hugo, another iconic Northwest poet, used a different metaphor. To create poems, Hugo suggested, a young poet should set up a "triggering town." The poet would imagine a small town and then describe it. He'd populate the town with real things and then he'd insert some imaginary ideas too: a mayor who was always re-elected or a hardware store that sold only hammers. The more that the fledgling poet wrote about the town, and the more he reimagined it, the more that the emerging poem would be about something other than the town. The triggering town was the stage set that a writer needed to get started. Then, the poem would roar off, blowing out of town, steering to far off places, other discoveries. I think of our crossroads, our rooms here in Mary Gates 211, as a 3D "triggering town." In this intersection of students, faculty, staff, visitors, we create a place that resembles our hometown. It feels comfortable and familiar. But it's also a place that pops with imagination; it's a place that feels unexpected and surprising. You never know who will turn up or what kinds of expertise they will have. That's why Honors is a great place to begin all kinds of writing. Our investigations start comfortably, in the settings of classes and informal conversations, and then they roar off onto journeys to find things out. Frances McCue, the Honors Program writer-in-residence, teaches courses on writing and recently led a foreign study program in Morocco. 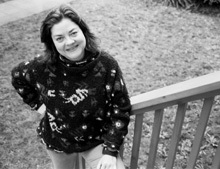 Her 2011 collection of poetry entitled The Bled won the Washington State Book Award for Poetry.